I signed up for NaNoWriMo this year, and apparently it is taking over my life. I will post an update soon, and I do promise to catch up. The week was fairly quiet until today. I decided to do NaNoWriMo this year. I have made my daily word count, and I am feeling pretty good about everything. We shall see how things go tomorrow. :) Feel free to add me as a buddy; my name is FunIsReading. In other bookish news, I won nine books in various giveaways this week. It is kind of crazy. It has gotten to the point that I feel sad when I go an entire day without winning a book. Winning this many books in a week rarely happens. It has been a nice daily pick-me-up. 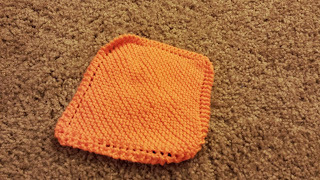 I knit a very lovely orange washcloth this week. It is very Halloween-y. I cannot wait to use it. It is very soft and comfy. What is that you say? A shawl? I have no idea what you are talking about. I just knit washcloths. Lots and lots of washcloths. Did you watch Grey's Anatomy this week? It was a little excessive with the spooky story lines. Zombies freak me out, so the zombie story line did make me a bit nervous even though I knew that Grey's Anatomy is ridiculous but not THAT ridiculous. Scandal was pretty amazing. The woman who plays Olivia Pope is pregnant in real life, I wonder, if the pregnancy is going to be written into the show's plot. I have started work on the Bigger on the Inside. It is still slow going, but I am hoping to be done with the increase section by the end of the week. I get tired easily knitting with such small needles. It is looking great though. I am curious how big this shawl is going to be when it is all done, because so far it isn't too big. Of course, I need to block it to truly see its length. 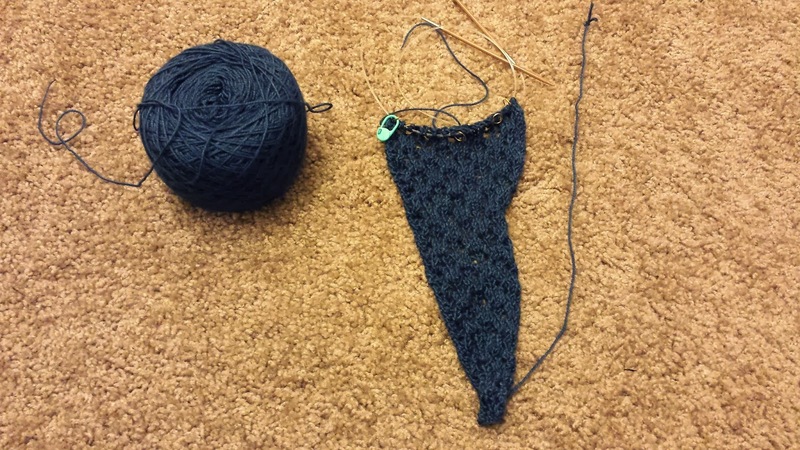 I watched Supernatural while working on my shawl tonight. I have gotten a bit tired of the show; however, this episode had two (!) female characters that were pretty awesome. Also, the episode's villain was a witch, so there were three female characters and three male characters. This is crazy! In all seriousness, it was a breath of fresh air to have female characters on this show that weren't love interests for Sam and Dean. Reason for Discovery: I love Cathy Carron's hat patterns. Forget tired scarves and bulky turtlenecks-funky, chunky, hip and happening cowls are where it's at! Following up her hit book Hattitude, author and designer Cathy Carron weaves a fashion statement that puts in-the-know women head and shoulders above the rest. Among the more than 35 patterns provided here are a cozy neck wrap featuring a built-in iPod holder, a lacy drawstring hood, and a woven necklace sparkling with Swarovski crystals. First Impressions: It is a Cathy Carron book! Yea! I love her hat patterns! I love cowls, because they keep my neck warm but do not take ten million years to knit. This will be the best book ever. Hmmm, these patterns are interesting. I am not sure who is supposed to wear these cowls. They are pretty, but they seem a bit large. The Details: This book contains 41 cowl patterns. 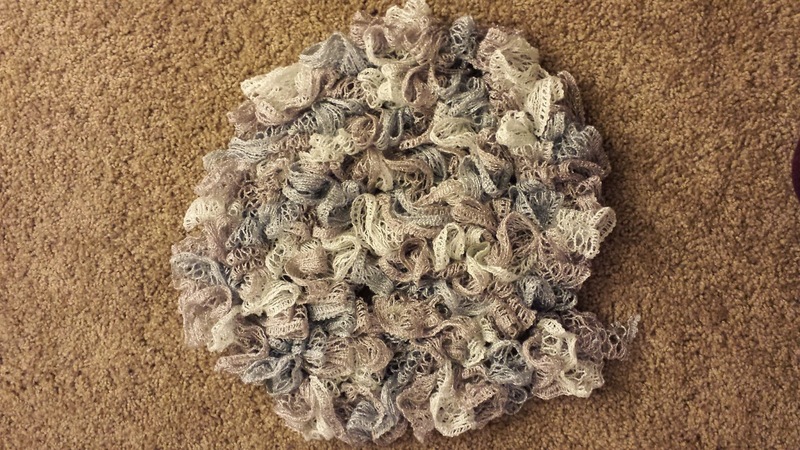 The majority of these patterns use bulky yarn. Because most of these patterns use bulky yarn, these are large cowls. These are statement pieces, not just cowls to keep your neck warm. I don't think I have ever seen a man wearing a cowl, so I am going to assume that these patterns are for women (the models are all women). In regards to range of difficulty, there are patterns to fit all levels from beginner to beyond. This book assumes that you know the basics. With that said, the patterns are short and fairly straight forward, so once you start knitting some of the patterns, you should be able to branch out to the more complicated patterns in the book. 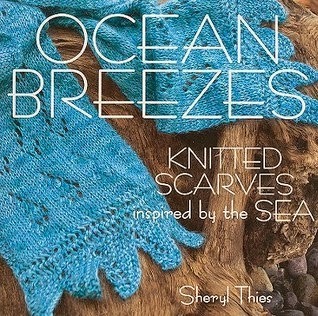 The yarn used in this book comes from your friendly, neighborhood yarn store, not your big box store. Final Impressions: Cathy Carron patterns are always fun. This book is no different. There are definitely some fun patterns in this book; however, I think I am not the demographic to wear most of these cowls. There are a handful that I can see myself wearing (a 30-something year old), but for the most part, I think you need to be a teen or in your 20s to pull these cowls off. Because most of these cowls are made with bulky yarn, you could knit up a bunch of these and hand them out to the younger girls on your holiday present list, if you don't fit the "cowl girls" group. I give this book 3 out of 5 balls of yarn. Today has been an amazing day. It has been one of the best days ever. On the way to Wal-Mart, my husband and I stopped by Barnes & Noble to check out the books and games. In the new science fiction and fantasy section, in the far bottom right corner, was a few copies of Parasite by Mira Grant. The whole world stopped for a moment. I have been reading it, since we got home. It is so good. So my Bigger on the Inside shawl hasn't grown since last Tuesday's post. I know you are surprised by this. It will get longer. Soon. On the other hand, I have been knitting! 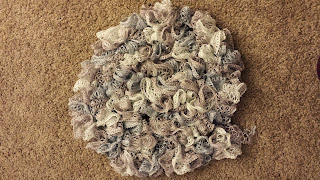 I made yet another ruffles scarf (this is #5 if you are keeping count). I knit this one last night while watching my regularly scheduled television shows. It was so much longer than I was expecting. I think with this yarn (forgive me, I don't have the yarn band handy) I am going to have to cast on five stitches not four. 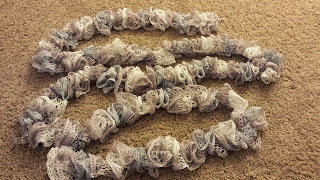 I could have had two scarves of reasonable length with one ball of yarn. The scarf is really pretty though. I watched the pilot episode of Dracula tonight. This show is so ridiculously cheesy that I cannot get over it. I think I am going to watch all the episodes when it hits Netflix, because it is that perfect level of cheesiness that would be perfect for a Saturday afternoon with popcorn and knitting. My Friday post is a going to be a little late. As you can see, it is Saturday. To make it up I will have another post this week. Also, here are videos of cute cats. I have been having lots of fun this week. I rewatched Pacific Rim and went to a Halloween party. Overall, it has been a pretty fun week! Oh, yeah, I even got some knitting done! 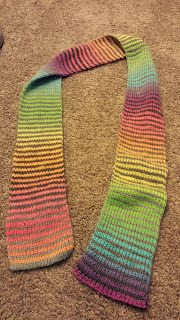 I finished the Chroma Stripped Scarf! Finally! I am a bit disappointed in the final result. The project itself looks pretty. There is just a handful of mistakes that I can see that bother me. None of them were worth fixing though. No one will notice them when I am wearing it. I just don't want to give it out as a gift. I can always deal with having another scarf though! 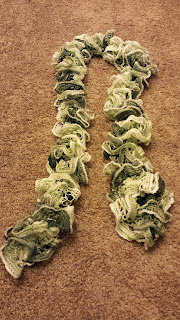 Last night at knitting group, I knit a complete scarf! 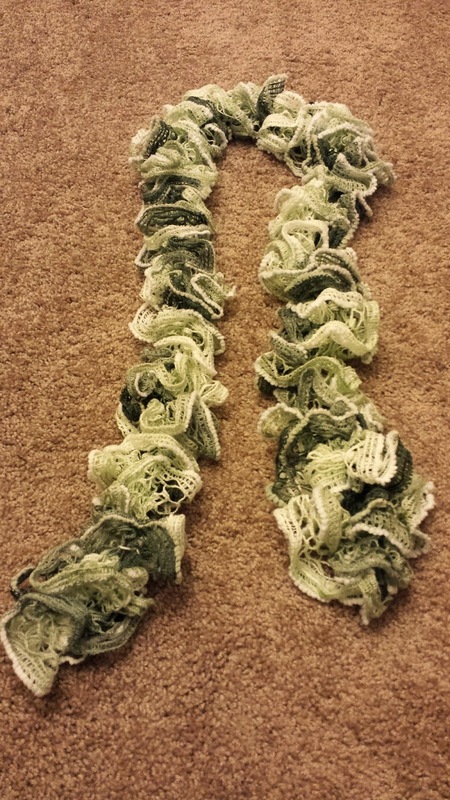 I made an entire scarf in two hours! 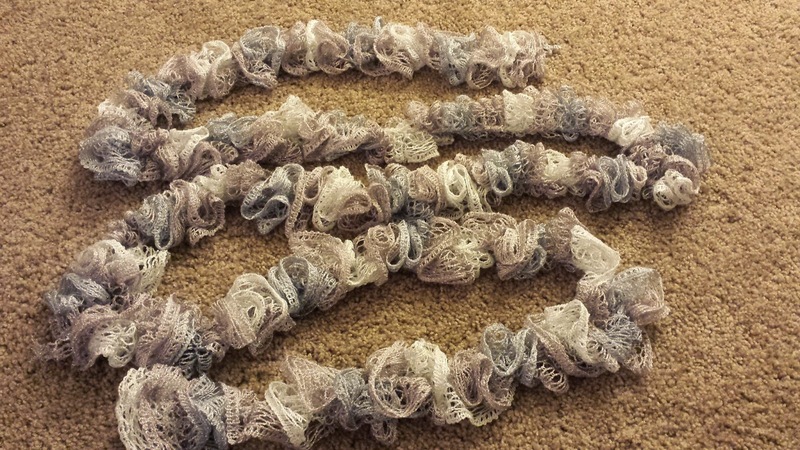 Okay, it was a ruffles scarf, but it is a whole scarf. 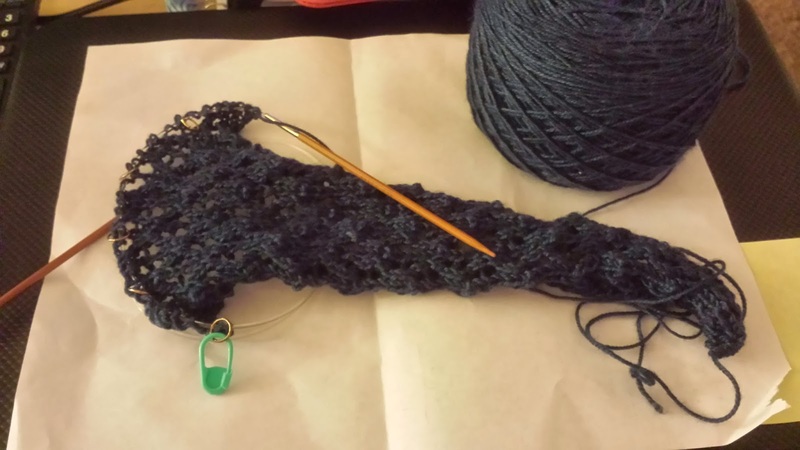 It felt so nice to knit an entire project that was not a washcloth in one sitting. Isn't it pretty? I love the green. I decided to break down and watch The Vampire Diaries. I wasn't planning on it. It was getting a bit silly, but then I wanted to knit, and I had nothing to watch! It is definitely silly. I feel like I am watching the season of Buffy when she goes to college. Initial Impressions: This book is really pretty. I actually want to knit most of these patterns. Why haven't I heard of this designer before? The patterns are all unique and pretty. I want them all. 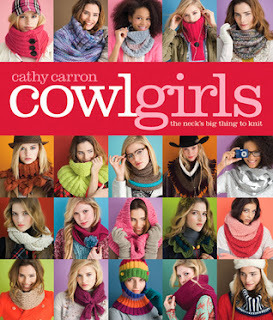 The Details: This book contains 25 patterns: 21 scarves, 1 cowl, and 3 shawls. 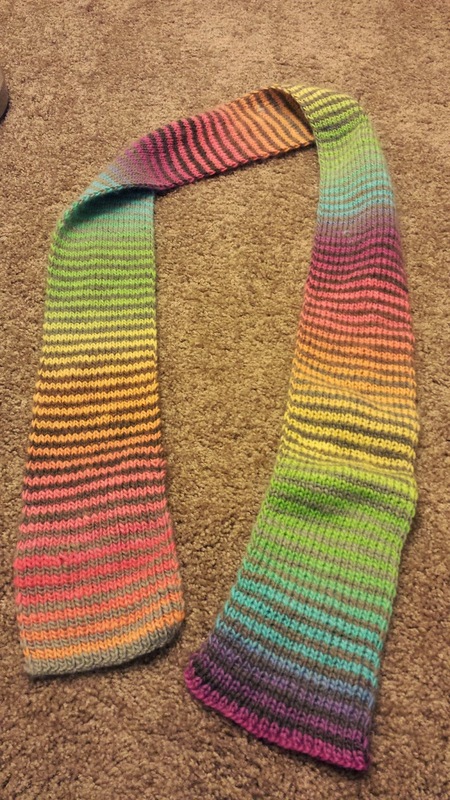 There is one color work scarf. The rest of the patterns rely on texture or lace. These patterns range in difficulty from beginner to more advanced. As an added bonus, at least three of the patterns would work for more "manly men." There are even a few more that I could see knitting for men that I know. This book uses a range of yarns; however, these are yarns that you are going to find in your friendly yarn store, not your big box store. Final Impressions: I love this book. There is a ton of variety in the patterns, and I know I wouldn't get bored, if I decided to knit every pattern in this book. There is a pattern for everyone in this book. There are scarves for the more adventurous to the more conservative of your friends and family. I give this book 5 out of 5 waves.